Inspired by a recent photo book I purchased, "Creative Flash Photography" by Tilo Gockel, I set out to create a series of food photos this week as part of a Thai dinner theme my wife and I decided on. The principle here was simple: create a great image using a single speedlight and a bounce card. That’s it. The final image should appear as though it was shot in a restaurant near a large natural light source, although this couldn't be further from the truth. The final image here was shot in my apartment (which is already fairly devoid of natural light anyway) at 8 p.m.
For this shoot, I used a single Yongnuo YN560IV speedlight set to manual mode and fired wirelessly with the YN560-TX on camera trigger. 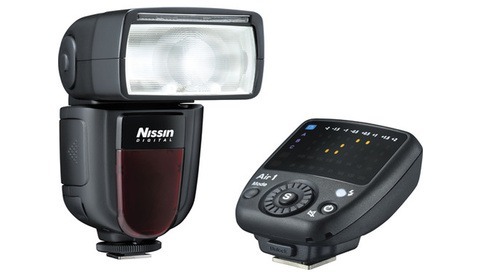 You can get two of these flashes, plus the wireless trigger, and a pack of gels (very useful for creative flash photography) for $180 from Amazon. An incredible deal considering Canon’s comparable 580EX II speedlight is $430 brand new without a wireless remote. I’ve had these for two years now and they’ve never failed me yet. If one did I could easily replace it. Does it have TTL? No, but I would argue that shooting manual is preferable in most cases anyway. High-speed sync would be nice but that is for another article. The point being, if you don’t own a flash yet you should definitely get one as it opens a door of endless possibilities for your photography. The flash was fired into a 45-inch Westcott umbrella with a black backing set diagonally behind and to the left of our main dish. Directly opposite, camera right, was a large piece of white board balanced against a stack of books. No umbrella? Use a large piece of computer paper folder in half so it can stand. Fire the flash directly into the paper placed approximately 8-10 inches back for a similar effect. You could also substitute white paper on the opposite side as a bounce. The setup. One umbrella with a flash bounced into a black back and directly opposite of this is a large white fill card. My camera then split the difference. My camera is a Sony a7R II with a Canon 100mm f/2.8L macro lens. Yes, an expensive setup, but you could just as easily do this shot with a Canon Rebel and the kit lens. The background might not be as blurred but if you zoom all the way out and get very close to the plate, it will do just fine for our purposes. My wife and I decided to meal plan for the week and decided on a Thai theme. Our Monday night dish was the famous Pad Thai which has a myriad of colorful and interesting ingredients. Any dish will work, but the key is color coordinating everything in the image for a balanced look and feel. The final dish prepped in our wok. For my shot I used a very basic white circular plate with a small, green bowl in the back. We shot on the coffee table which has a nice, unfinished wood top for a neutral tone. 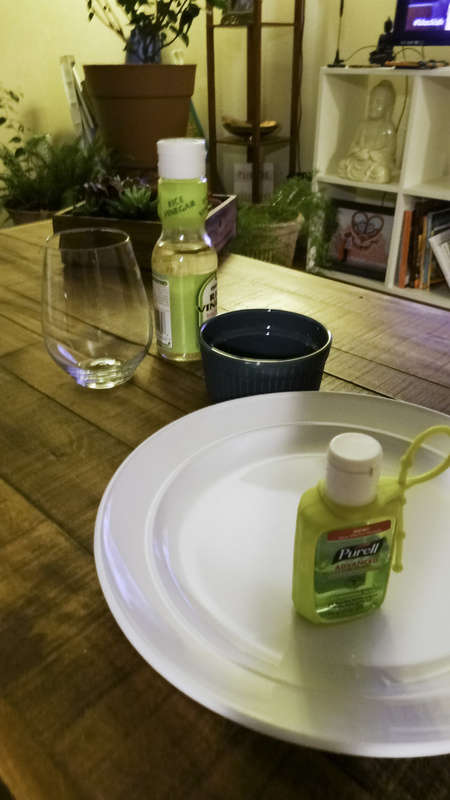 In the background I placed a bottle of white wine vinegar as the label had a green that would match our bowl and some of the toppings to our dish. I also added a stemless wine glass in the back to provide a bit of sparkle and additional background interest. Finally, a faux succulent pot in the very far back to provide a bit of geometry to the background and a sort of stopping point for the viewer’s eyes. This is the point of view from my camera. While the objects may appear fairly close together, the long focal length of 100mm coupled with an aperture of f/2.8 and a very close proximity will result in a very shallow depth of field. Here's the view from my LCD screen. Before we ever started cooking, I set up my gear and starting playing with the composition of the image. 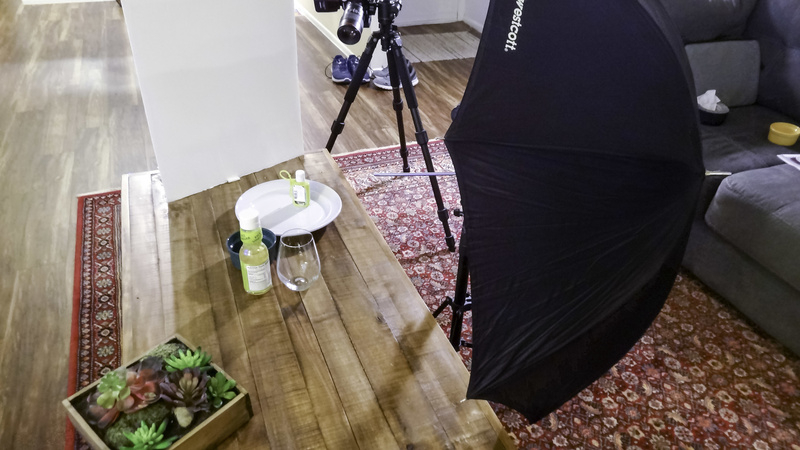 This is probably the most tedious and time-consuming aspect of any food shoot. I obviously wanted the main dish to appear front and center but because the plate was fairly large, I didn’t want it to dominate the entire scene. I opted for a portrait orientation to eliminate some of its size and positioned the green bowl directly behind and to the right for a left to right flow through the frame. This is a very natural progression for the eyes because of how we read. 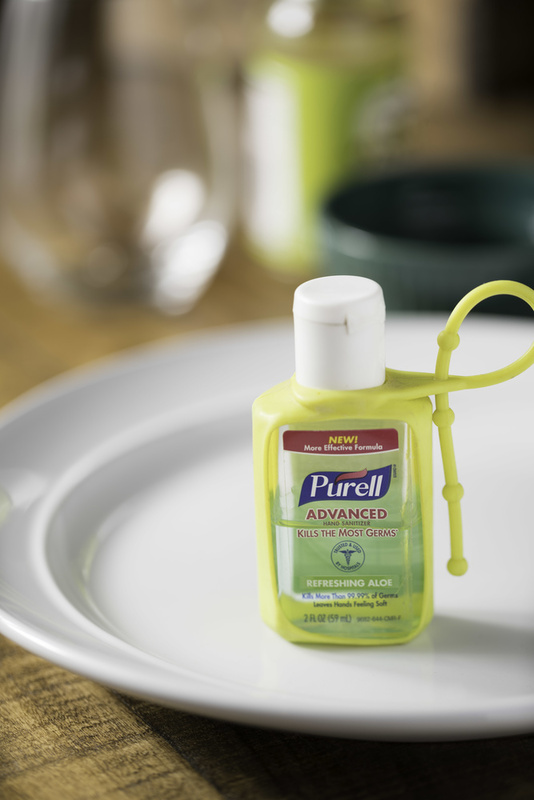 I used a bottle of hand sanitizer as a food placeholder and set my focus using an aperture of f/2.8. You’ll want to generally shoot as wide open as possible for a nice blurry transition from front to back. I used a shutter speed of 1/125 sec to completely eliminate the ambient light in the scene. This is very important as you do not want any light contamination on the subject. The ultimate goal is for the shot to appear bright and white as if shot near a large window. Most camera sync speed’s, i.e., the fastest shutter speed you can utilize with any given flash, are 1/250 sec or less so be sure and check your camera’s manual to figure this out. Going over the camera’s sync speed will result in an unsightly black bar appearing across your image. Take a test image with the flash turned off and it should appear virtually black. If 1/125 sec does not eliminate all ambient light, turn off more lights in your house or stop down your aperture with the latter being a last resort. Set a white balance of "Flash" for consistent color. Finally, turn your flash on and set it to 1/64 power. You shouldn’t need much juice for a shot like this. I ended up on 1/32 power when it was all said and done, give or take a few 1/3 power increments. Check your histogram and be sure it is slightly to the right with no blinking highlights for a proper exposure. Make sure your flash and bounce are fairly close to your subject for a nice even illumination. Take a few shots and make sure you’re happy with the composition and lighting. Even small movements in the flash or the bounce card can make significant changes in your image. In the "before" image below, the bounce card is further from camera right versus the "after" image where it is closer. It is highly advisable to try a few variations and see what looks best. Finally, the food. Cook the food and plate it as soon as it is done. 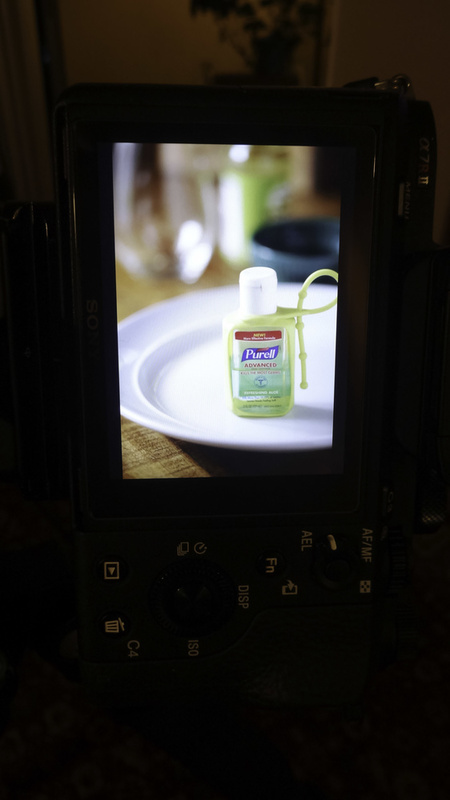 Food for photos will generally last 5 to 10 minutes, after which the oils and fats begin to cool and lose their luster. At this point, the image will not look near as tasty. Be sure and clean your plate as fingerprints or spots will show up very clearly. Focus will be the trickiest part, and in my experience, this is where the most errors occur. It is difficult to gauge focus from the LCD preview so be patient and try a few focal points before you decide. In the end, it should feel very natural where the focus lands and if something feels off when you look at the shot, it probably is. The final image. In Lightroom I increased the exposure by 1/3 stop, shadows +15, vibrance +25, sharpened the area in focus, boosted green saturation, and whitened the plate and bean spouts further by decreasing their saturation with the adjustment brush. I am constantly amazed at how easy and affordable it can be to do great photography. If you have a chance to check out Gockel’s book, I would highly recommend it. He uses incredibly simple techniques and gear to make amazing images and gives step-by-step instructions on how to do so. 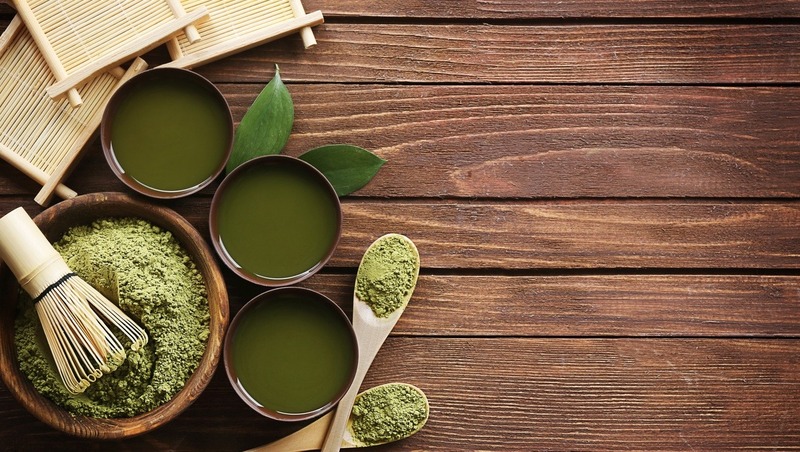 Hope you found this article helpful. That's a heck of a lot better than my first food photography attempts but a few things you might want to try. 1.The light is too close. I'ts leading to some un-evenness in the illumination. 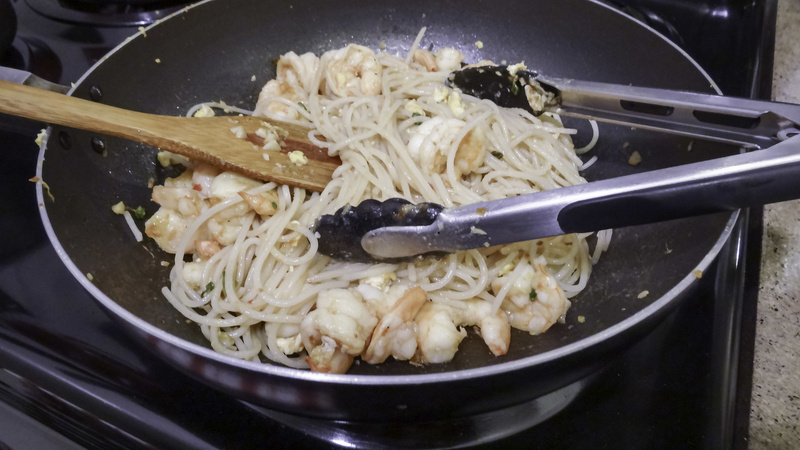 The noodles and shrimp on the left are very bright. Part of this has to do with the way the dish was arranged and part of this has to do with the fact that the light was too close. 2.The light is flat. Either bring in some more hard lights to highlight texture or use a little bit smaller umbrella a little bit farther back. 3.Don't be afraid to get things in focus. Stop down a little. The lighting and positioning of the main food should draw your eye and everything else should help tell the story of the food. A steak with a breadbasket and some wine and a candle tells the story of a romantic dinner at a quiet restaurant. Too much bokeh in food photography can be distracting and it makes me want to put on a second pair of glasses. 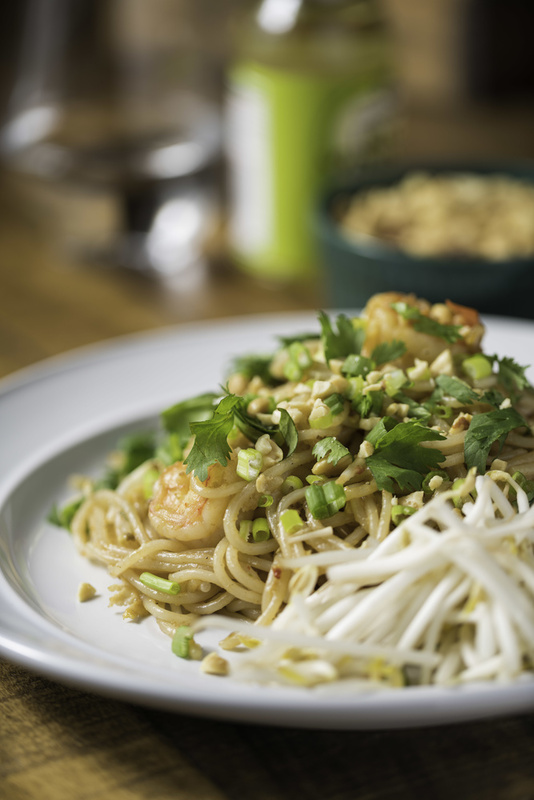 4.the bean sprouts disappear into the plate. Watch out for similar things adjoining like that. Agree on all your points. Food photography can be one of the most stressful photography out there. Sometimes you have only minutes to get the lighting correct before the food becomes unphotographable. Some of the dishes I photograph have a retail value of over $150 so you only get one shot to get it right. Hey James/Felix-I sincerely appreciate you taking the time to read the article and comment. Constructive criticism is important in this field and should never be taken personally. I don't particularly agree with everything you've said but nonetheless your comments were genuine and honest. The article was simply meant as a way to show beginners starting out with flash that you can make good images with little to no gear. Many of my articles are meant for amateurs getting started in photography and may be less desirable for more advanced users. Do either of you have a profile or website we could see? I noticed that both of you do quite a bit of commenting, most all of it negative, on various Fstoppers articles. It would be good to showcase some of your work as a basis for some legitimacy with regards to your feedback. Thanks again. You are absolutely right most of my comments have been negative which given even a little consideration isn't something I want in the long run. Reflecting on the reasons for my negative comments I've realized it's because I consistently strongly disagree with what's being written and what has been published. I imagine a couple of my more impressionable photographer friends reading one of these articles. I imagine them taking it as the truth from an expert and I simply hope they make it to the comments. This article was a good example. You're not a food photographer but you drew me in with a really nice photo and what I can now only assume was stock imagery. You proceed to explain that even though you have no idea what you're doing you're going to teach us how to photograph food and then you do what if I'm being honest rather than being constructive amounts to a truly terrible job. Why on earth would you write about that? It's fine if you don't know what you're doing and It's fine if you're still learning but don't try and teach something that you only have the faintest idea about. The fact that you're marketing this to newbies only makes it worse. They don't know enough to know what you've done is wrong. They trust fstoppers is a reputable site. It's clearly not. The editorial staff, if there is one at all, isn't capable of making decisions about which articles have value to them and which ones don't. 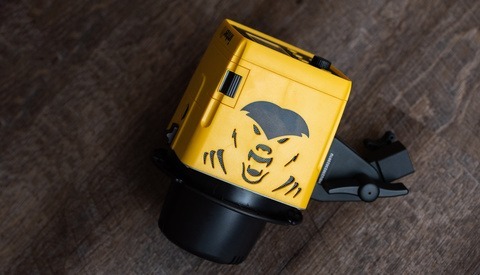 I don't want to be a part of fstoppers in any way going forward. As good as the six tutorials I bought were I won't buy another tutorial. I won't comment. I won't read the articles. I wont be back. I want to find a site where informed writers and well meaning editors publish articles that are truly useful and I want to write comments that don't require any form of reasoned response because the article doesn't need them. I want the comments to simply say "wow I'd have never guessed" or "My god those images are amazing". I agree with you on every point James. The photo of the cover shot from the top was very attractive. What a disillusion after reading the post. Sorry guy but stop lying on the blog pls! Agreed. The expectations of the main article photograph made me feel like this was going to be some really interesting and relevant to things I like working on. While I enjoyed the process and discussion, the final images is lacking. Wish you would have set the scene (like your article images does) with open space and being able to identifying other elements on your scene. Hey Mark - I hope you weren't offended by my comment. Overall the article was very through. I think posting some different orientations or perhaps a few different variations of the set-up would have really helped the audience see how compositions can look. I wouldn't say I'm a food photographer but I enjoy doing some from time to time. Appreciate your contributions to the site and taking the time to educate. Hey Steven! No offense at all, I sincerely apologize if it came across that way. I agree that the article's lead image is very well done but it is a completely different image on many levels. Different compositions would certainly have been helpful in the article but it was more about the simplicity of using one light and having fun with it. The lead image could be shot very easily with one light and a form board as well. I may actually shoot my own version and re-post here just because haha. I appreciate the comments and wasn't offended, I just always like to respond with my thoughts as well. Thank you for your kind words and I will definitely have a look at some of your food shots! Hey Julian-I would have posted my image but they only accept landscape orientations for the cover. I see you are a fairly new user, to you happen to have a website we can look at? I'd love to see some of your work. Hey David, thanks for the feedback! My only retort would be that the image is about the food which is on the plate so it would make sense that its taking the majority of the attention. Not sure I would want anything else to focus much more although I agree that a stop down could have helped the background a bit. Sure, why not? You don't need 5 lights for everything. Also, "living" is spelled wrong on your fstoppers profile. 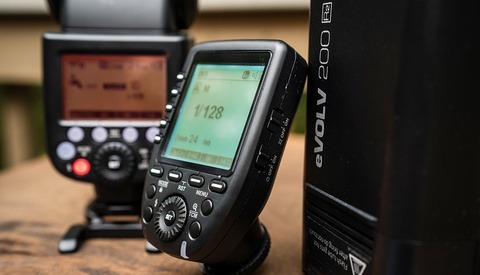 "With a Single Speedlight" means for me "With a Speedlight Only". But English is not my strong point, so the title of the article may be factually correct.